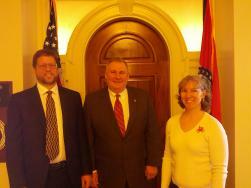 I spent the day in the Capitol with our Executive Director, Brent Hugh, and our lobbyist, Jim Farrell. Brent and Jim spend a lot of time in this building on behalf of Missouri bicyclists and pedestrians. From 163 Representatives and 34 Senators, we had time to visit half a dozen and we left information with a few others. Among those we spoke to in person were my friend from my Kirksville days, Nate Walker, and a Branson Representative who biked all the way to Jefferson City to file his candidacy, Jeff Justus. We are seeking sponsors for this bike/ped bill, and you can help by contacting your state senator or representative today and asking them to sponsor it! While an email is a good start, it's even more effective to schedule a phone call or speak to them in person. 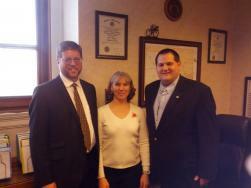 The most interesting meeting of the day was with Rep. Bart Korman. If this name rings a bell, it is because he introduced anti-bike legislation in the form of a mandatory sidepath law. I found him surprisingly reasonable. He has an engineering background and is knowledgeable about transportation and willing to consider ideas that many politicians find unpalatable. In introducing the mandatory sidepath bill, Rep. Korman sought to appease his constituents. That's important to remember: elected officials do listen and respond to their constituents, so the more you speak to them, the more they listen to you. "If you can help us solve Hwy 94," he challenged us, "we can help you." It was nearly a promise to sponsor our legislation-- and I know how to solve Hwy 94. Hwy 94 runs parallel to the Katy Trail through his district, and drivers object to the bicyclists in their way. The solution to Hwy 94 is not to ban bicyclists, who use the road instead of the trail for many reasons, such as reaching their destination. The solution is for MoDOT to prioritize Hwy 94 for wide, paved shoulders that make the road safer for everyone, including bicyclists. As a volunteer bike/ped advocate, it was a rare treat for me to spend the day with Brent and Jim at the Capitol and see your membership and donation dollars at work. I hope you will join us for Capitol Day on Monday, April 13 and help us visit all of our 163 representatives and 34 senators. #1. Help support our legislative work. It's our most important and effective work, but also the most time-consuming and expensive. We are just starting an ambitous $30,000 fundraising drive that will keep MoBikeFed going strong through the legislative session. You membership or special donation will be matched TWICE by two groups of generous donors. Most effective: Become MoBikeFed Sustaining Member - starts at just $5/month; no more renewal notices! #2. 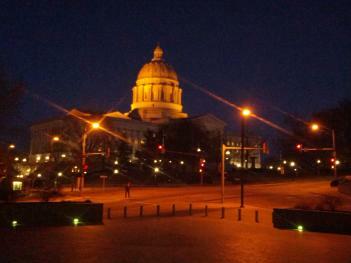 Contact your legislators in Jefferson City. Look up your own Missouri state rep by your address here. Look up your own Missouri state rep by zip code here. 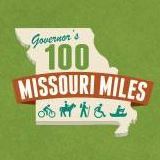 I am writing today to ask you to support better, safer bicycling and walking in Missouri. Please CC: director@mobikefed.org on your correspondence and on any answer; we'll follow up with legislators who respond positively to your request. Rachel Ruhlen is President of the Missouri Bicycle and Pedestrian Federation. Read more articles by Rachel on her President's Blog.